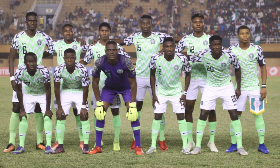 African Football expert and Canal+ pundit, Diomansy Kamara has shared his thoughts on Wednesday's 2019 Africa U20 Cup of Nations semifinal showdown between Nigeria and Mali in Niamey. The former Portsmouth, Leicester City, West Brom and Fulham striker believes the physicality of the Flying Eagles players could have an effect on the outcome of the match. ''Nigeria is a very physical team, I saw them play in all three games. This is a team that is not necessarily comfortable technically but who depend on their size,'' said Kamara to Foot Mali. ''It is good Mali qualified after losing to Senegal. I think this squad from Mali needs to be further improved. Nigeria will reach a record-extending tenth U20 AFCON final if they see off Mali at the Stade Général Seyni Kountché.